Gavin Newsom will be the first Democrat in more than a century to succeed another Democrat as governor and the succession also marks a big generational transition in California politics. A long-dominant geriatric quartet from the San Francisco Bay Area – Gov. Jerry Brown, Sens. Dianne Feinstein and Barbara Boxer and House Speaker Nancy Pelosi – has been slowly ceding power to younger political strivers. Moreover, Newsom is succeeding someone who could be considered his quasi-uncle, since his inauguration continues the decades-long saga of four San Francisco families intertwined by blood, by marriage, by money, by culture and, of course, by politics – the Browns, the Newsoms, the Pelosis and the Gettys. The connections date back at least 80 years, to when Jerry Brown’s father, Pat Brown, ran for San Francisco district attorney, losing in 1939 but winning in 1943, with the help of his close friend and Gavin Newsom’s grandfather, businessman William Newsom. 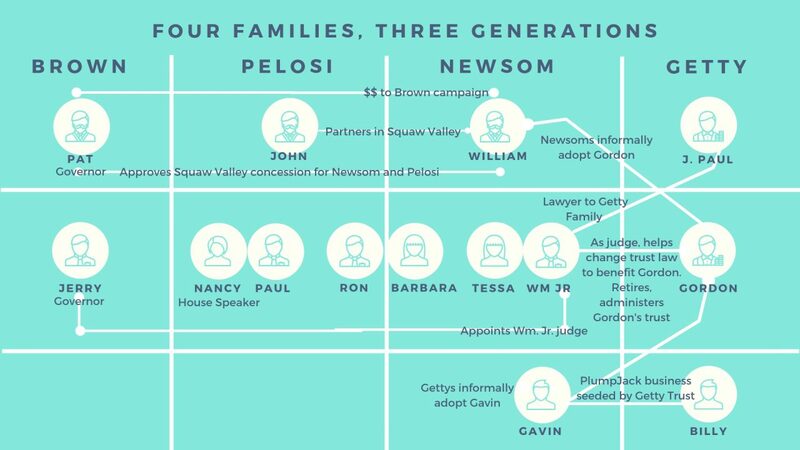 Ties among the Brown, Newsom, Pelosi and Getty families date back three generations. Click on image for a larger view. Graphic for CALmatters by Nazneen Rydhan-Foster. Fast forward two decades. Gov. Pat Brown’s administration developed Squaw Valley for the 1960s winter Olympics and afterward awarded a concession to operate it to William Newsom and his partner, John Pelosi. One of the Pelosis’ sons, Paul, married Nancy D’Alesandro, who went into politics and has now reclaimed speakership of the House of Representatives. Another Pelosi son married William Newsom’s daughter, Barbara. Until they divorced, that made Nancy Pelosi something like an aunt by marriage to Gavin Newson (Nancy Pelosi’s brother-in-law was Gavin Newsom’s uncle). The Squaw Valley concession was controversial at the time and created something of a rupture between the two old friends. William Newsom wanted to make significant improvements to the ski complex, including a convention center, but Brown’s Department of Parks and Recreation balked. Newsom and his son, an attorney also named William, held a series of contentious meetings with officials over the issue. An eight-page memo about those 1966 meetings from the department’s director, Fred Jones, buried in the Pat Brown archives, describes the Newsoms as being embittered and the senior Newsom threatening to “hurt the governor politically” as Brown ran for a third term that year against Ronald Reagan. Pat Brown’s bid for a third term failed, and the Reagan administration later bought out the Newsom concession. But the Brown-Newsom connection continued as Brown’s son, Jerry, reclaimed the governorship in 1974. He appointed the younger William Newsom, a personal friend and Gavin’s father, to a Placer County judgeship in 1975 and three years later to the state Court of Appeal. Justice Newsom, who died a few weeks ago, had been an attorney for oil magnate J. Paul Getty, most famously delivering $3 million to Italian kidnapers of Getty’s grandson in 1973. While serving on the appellate bench in the 1980s, he helped Getty’s son, Gordon, secure a change in state trust law that allowed him to claim his share of a multi-heir trust. After Newsom retired from the bench in 1995, he became administrator of Gordon Getty’s own trust, telling one interviewer, “I make my living working for Gordon Getty.” The trust provided seed money for the PlumpJack chain of restaurants and wine shops that Newson’s son, Gavin, and Gordon Getty’s son, Billy, developed, the first being in a Squaw Valley hotel. Gavin Newsom had been informally adopted by the Gettys after his parents divorced, returning a similar favor that the Newsom family had done for a young Gordon Getty many years earlier. Newsom’s PlumpJack business (named for an opera that Gordon Getty wrote) led to a career in San Francisco politics, a stint as mayor, the lieutenant governorship and now to the governorship, succeeding his father’s old friend. He’s keeping it all in the extended family. This entry was posted in Educational, Make America Great Again, NoBama, Rants, Sad Things and tagged Education, Government, NoBama, Progressive. Bookmark the permalink.